Oct 2, 2012 | This post may contain affiliate links. Learn more. For a retailer founded in 1901, Nordstrom has done an admirable job of embracing modern fashion and digital retail while still adhering to some important old-fashioned values. The Men’s Shop’s technology-enhanced Fall 2012 Sourcebook is one example, which picks up on the major theme of this blog — the value of dressing sharp. Nordstrom still mails sleek paper copies of these things, which is much appreciated, but the catalog is also available online in an interactive format that permits readers to click through to purchase featured items. 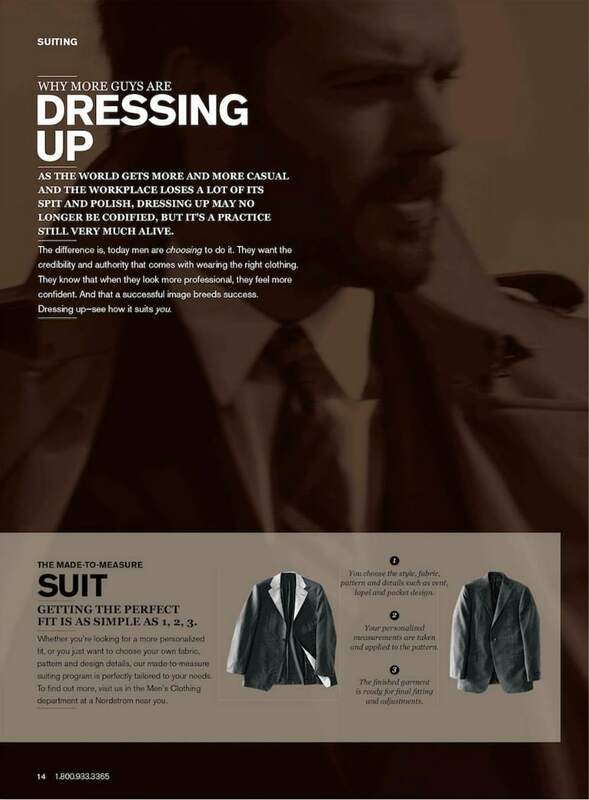 The company has also utilized technology in other ways, encouraging certain employees to use social media and, in March, launching a “made-to-measure digital selling platform” to incorporate a business-to-business iPad app into the MTM experience alluded to at the bottom of the catalog page below. In an economy that tends to prize speaking from scripts and rigid systems over problem-solving and employee initiative, here’s to those who are trying hard to provide seamless, convenient and pleasant retail experiences for the digital age. Catalog image used with permission of Nordstrom.